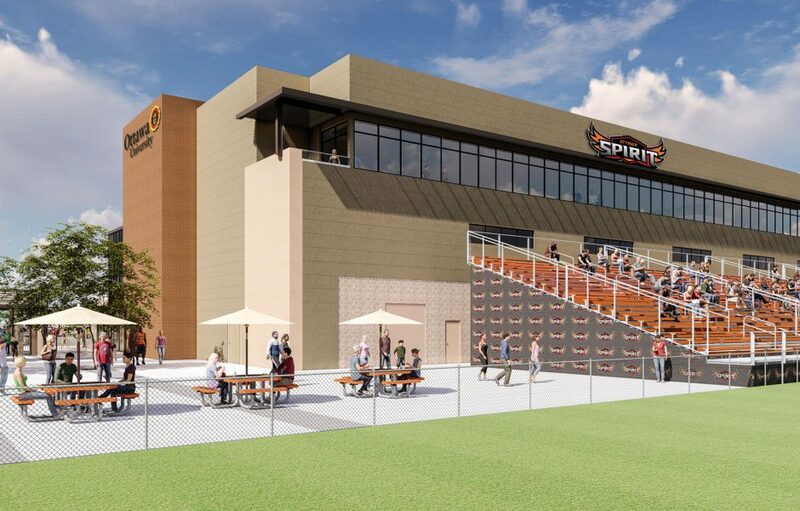 A major athletic complex at Ottawa University (OUAZ) is racing towards a 2019 finish date thanks to a team effort between Phoenix-based Cawley Architects, the school, and the City of Surprise. Cawley Architects is the design firm behind the $23 million, 110,000-square-foot Ottawa University Athletic Facility for Indoor and Outdoor Athletics. The project is at the SWC of Tierra Buena Lane and Civic Center Drive in Surprise. The outdoor center totals 58,000 SF and the indoor center totals 52,000 SF. “Ottawa University believes that sports programs and related student amenities are very important in influencing parents and students in their choice of post-secondary schools,” said Cawley President Sherman Cawley. “By having the best sports facilities, they are insured of having rapid enrollment growth,” Cawley said. 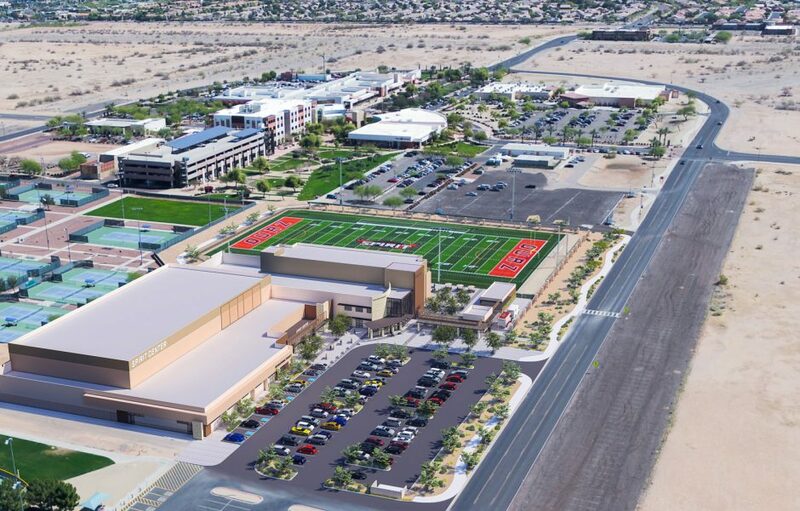 The project features two recreational facilities for OUAZ adjacent to the governmental campus of Surprise City Hall. The outdoor venue, named after its donor, is the O’Dell Athletic Complex. It adjoins a recently-completed state-of-the-art, multipurpose sports field for football, soccer, and lacrosse. 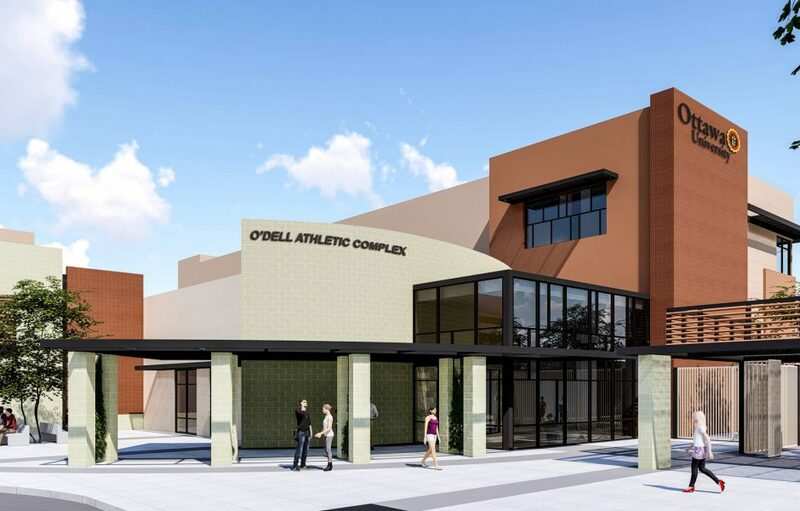 The main floor of O’Dell Complex will house locker rooms, training rooms, a major weight-training facility, and other supports for OUAZ’s 21 varsity sports programs. The second floor of the facility will house athletic department offices, student study areas, labs, and classrooms. The third floor of the O’Dell building will feature the field press box and hospitality entertainment areas overlooking the field. The indoor facility, not yet named, will have a large multi-purpose gymnasium for competitive basketball and volleyball with bleacher seating, two practice courts, a main lobby for tickets and concessions, and a recreational center. The rec center houses a walking track, cardio and weight workout area, and three multi-use studios. 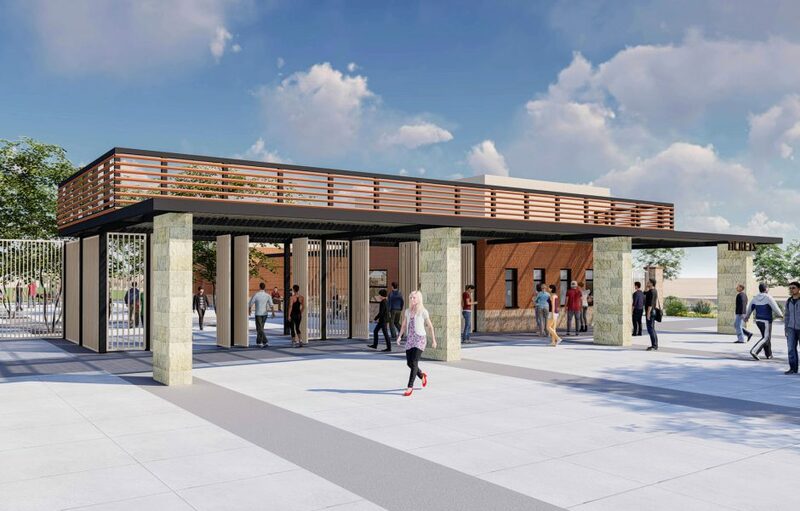 Completion date is 3Q 2019 in time for OUAZ’s fall opening that August. OUAZ opened its campus in August of 2017 with 434 new pioneer students, nearly twice the original projections. “We have been very pleased at how the various parties have worked jointly to bring forth the very best cost and design solutions,” said OUAZ Chancellor Kevin C. Eichner. Other team members on the project include Haydon Building Corp. (general contractor); Dibble Engineering (civil); Pearson Engineering (electrical); MDI Engineering (mechanical and plumbing); and CTS Engineering (structural). In addition to its new Surprise residential campus, Ottawa University serves more than 4,000 students through its original, 153-year-old campus in Ottawa, Kansas, and at its adult education sites in Overland Park, Kansas; Milwaukee, Wisconsin; in central Phoenix just off I-17 between Peoria and Dunlap avenues; as well as through its robust online offerings. The university has been serving adult learners in the Phoenix area for 40 years and boasts more than 8,000 alumni in the Valley.